Safety: if you see CE brand it's safe, otherwise it isn't! In full compliance with the existing laws, SERIE FUTURA products undergo specific tests so as to prove their certified structural solidity. You can feel safe at last! Any product which is not certified can be left unpaid and contested within 10 years from installation. What is a gate certification? 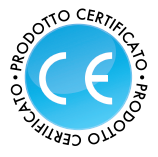 The certification is essentially a SAFETY guarantee. Any product which is sold within the European market must be compliant with specific regulations. In case of objects that, while opening, could cause damages to things or people, the European Community has set building and functioning parameters to grant the SAFETY of people living and moving around these objects. Change your way of thinkng! Every year many accidents are caused by "unsafe" gates. Main causes are simply due to bad construction or assembling procedures as well as the lack of maintenance over the years. This occurs for both old and recently produced gates. Who can certify a gate? In Italy, as well as in Europe, there are agencies whose task is to assess, for each product, the needed procedures to obtain full compliance with standard requirements. The risks related to uncertified gates installation are not widely known. At present, the majority of producers are not able to certify their products properly. the law does not allow ignorance! Would you drive your car with no driving license? As far as gates are concerned, the European Community has issued, since May 1st, several norms which "bind" to safely build and to stick to scheduled maintenance plans. Such norm, extended into 19 further norms, allows a standard European reference system, by setting the product’s manufacturing criterias as well as the responsibilities of both installers and purchasers. Therefore, in accordance with the regulation applicable on construction products, the installation of non-certified products is forbidden. Any violation to such requirement is punished by possible seizure of the good in addition to economic sanctions, as well as consequences in law and penal sanctions as provided by the relevant codes and/or by the latest Consumption Code. Moreover, in case of self-built goods, The producer is bound to certify the product itself and not just its installation. Such procedure must be carried out only by approved authorities entitled by the European Community. All products with no conformity mark, or certificate of conformity, or the specifically required labels, must be withdrawn from commerce and cannot be incorporated nor installed in any building (art. 11.3 PD 246/893). Whoever puts on the market, trades, distributes and installs devices with no mark and/or certificate of conformity and/or the mandatory documents will be subject, for any violation, to administrative sanctions from € 2.000,00 to € 120.000,0 (art. Dlgs 194/07) ). The supply and installation of products which are not compliant with legislative provisions on marks and/or safety will determine, depending on the case, the nullity of the contract or a severe breach of it, legitimising the purchaser to reject the product, to refuse the payment and to claim for damage refunds.